Toshiba 65L9363 review | What Hi-Fi? The 65L9363DB isn’t Toshiba’s first foray into Ultra HD TVs. 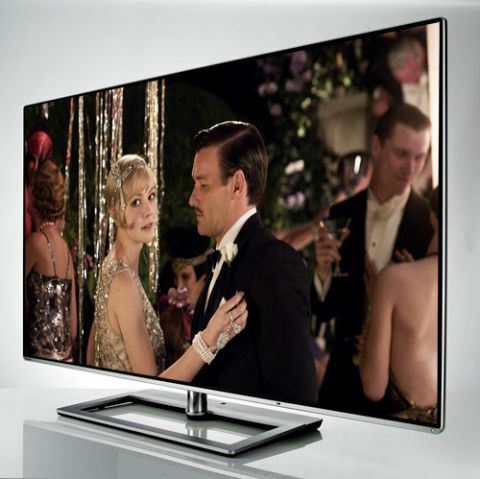 Its 55ZL2, launched mid-2012, was a UHD set too – and it also happened to be the world’s first glasses-free 3D TV. It had a 55in screen and cost £7000, which makes this 65in set appear quite the bargain. There’s no glasses-free stuff here, and the 3D tech is of the passive variety – but the screen does it all in some style. The TV produces a captivating and immersive picture with the 3D animated adventures of Despicable Me. As Gru launches his rocket-ship into space there’s a great deal of depth to the picture, but it’s not off-putting. The Toshiba looks immediately at home with UHD fare. Play a 4K clip of After Earth and the depth of colour and shades of green and brown look rich and believable, even if the picture lacks the punch and pizzazz of the class-leaders. Its ability to produce deep, rich blacks works well in outer-space scenes, but it has a little difficulty where there’s a demand for more subtlety and shadow detail. Dialling down the strength of the blacks doesn’t really help either, and just results in dark areas looking increasingly unconvincing. That inability to produce a picture with true conviction leaves it trailing when compared to its rivals. Motion is good, though. With most of the picture-processing modes turned off (there’s just no need for them with native 4K content), the screen displays a good sense of stability. Shift down a gear to Blu-ray and the Toshiba starts to struggle; you never really feel as if the Toshiba’s Cevo 4K processing engine is making the most of the content on the disc. Other UHD sets we've reviewed seem to be blessed with better upscalers, filling in the missing information more accurately. Watching The Lone Ranger, the Toshiba can’t pick out enough texture from our hero’s mask, and the fine pinpricks of stubble look soft. The jump between standard-definition Freeview channels and their high-def equivalents just doesn’t produce a big enough leap in quality, either. Yes, you can make out a little more detail in the Queen Vic during a high-def episode of EastEnders, but the general character of the picture isn’t as glossy, detailed or pristine as it is on the other TVs here. Toshiba’s new (but basic-looking) Cloud TV platform is your portal to all things smart. For those keen to stream, Netflix, BBC iPlayer, and Deezer are all present – but like the Philips 65PFL6708, the Toshiba’s offering is limited. Catch-up TV services are very thin on the ground here; you can experience more by going down the Sony or Samsung route. The Toshiba is listenable but lacks the finesse and detail served up by rival sets from the likes of Sony, Samsung and Philips. There’s Audyssey ABX processing for tweakage, though. Turned off, the TV sounds solid but unspectacular; set low, it keeps the balance but adds a dose of low-end reinforcement; on high it all gets overpowering, with a hint of distortion. Unfortunately we can’t fully recommend the Toshiba. While the 3D performance is great, there are just too many other flaws for us to ignore.